#cattubemat Several weeks ago my son asked me if I wanted a puppy. I told him no, we have 2 Chow Chows and the male is 16, the female is his daughter. I actually had given her to a neighbor a couple of years ago when she was a pup, but she still comes here and hangs out with her dad everyday. I told my son I didn't want anymore dogs, so the next day he comes over with this tiny little puppy. She was so ugly she was cute, she's a chihuahua/yorkie mix, if you can imagine. She's mostly white with a brown saddle across her back and brown ears, and fur that's not sure if it wants to curl or what. She could stand all 4 paws in my hand , she was 9 weeks old. I tried to act like I was aggrivated with this "situation", but it was actually love at first sight. I thought my son was going to take the pup with him, but he left it with me. She has become my little shadow, every step I take she's right there under my feet, pulling at my pants leg and wanting to play. If I sit down she thinks my lap is just for her. Long story short, I needed to get a bed for her. I looked at several, then I saw this one. It's perfect! The picture of this Pet Cat Tube shows a cat snuggled up in it, but I thought it would be just right for Millie, and it is. 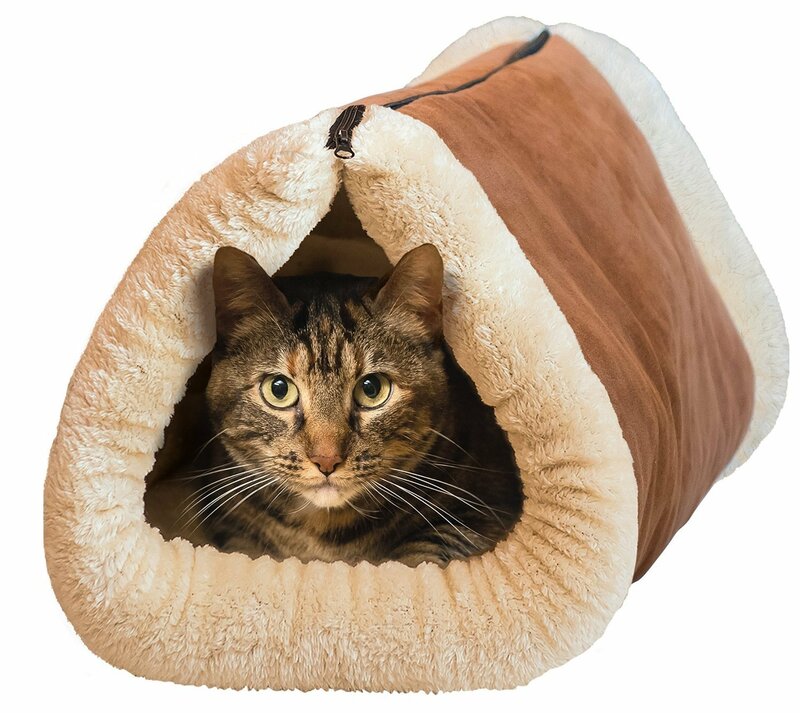 The Pet Cat Tube is a nice thick mat when you lay it flat, but you can zip it up and it becomes and tube to snuggle up and sleep in. It has a self heating thermal core that keeps your fur baby warm, and one of my favorite features is that there's an electrostatic plush material that attracts shedding fur so it stays off your furniture and carpet. It's machine washable too. It's very lightweight and portable, you can take it anywhere.